Video showing recovery at day 12. Common: The inside of the knee is the commonest area to wear. Indeed, the knee very much splits in to 2 halves with the front being an addition section where the knee cap functions, giving a total of 3 sections or compartments - hence the term "unicompartmental". Pain: Typically pain is felt just below the knee at the very top of the shin bone. Pain is worse the more one walks on the ke. Generally it is comfortable during sleep although movement during sleep can cause one to wake. Pain is a knawing type pain. Generally it starts gradually. 3. Previous "cartilage" operation. 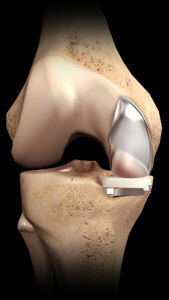 Removal of part or all of the inner cartilage (medial meniscus) predisposes to later wear of the inner side of the knee. 4. External rotation of the thigh bone (if you look down and turn your feet out and can get to the 9 and 3 O'clock position it is a good sign that the thigh bone has an external rotation bias. (this preferentially loads the inner side of the knee). Revovery 3x as fast as standard Total Knee Replacement. For Young patients it can be regarded as a pre-knee replacement - it is straigtforward to change to a Total knee Replacement later if required. The Australians term it a "re-tread"
Operation takes approximately 45 minutes. Video of a patient at 6 weeks and then two patients following Medial Knee Resurfacing just getting ready to go home following Surgery in the morning. 1 in 3 people with painful knee arthritis are suitable for the partial knee replacement instead of the traditional total knee replacement. Your scar is only about 3 inches long.